Power-producing Finavera Aquabouy. Submitted photo. Our corner of the world is on the verge of becoming famous in a new and unprecedented way. The State of California has adopted the most aggressive goals in the country for developing renewable energy and reducing greenhouse gas emissions. Here in Humboldt County, plans are underway to make us a leading player in one of the most exciting sources of clean, renewable electricity: ocean waves. It's obvious when you think about it. The sun doesn't always shine, the wind doesn't always blow, but day and night, in calm and rough weather, ocean waves are practically begging to be exploited. However, the technology for generating electricity from ocean waves is still in its infancy, which is why our coastline can play such an important role. Why? Because the deep (300+ feet) water two to three miles off our shoreline has the best combination of average wave height and frequency along the entire coast of California. Not only could we become self-sufficient in energy if the power of our waves were harnessed, but ultimately we could be net exporters of electricity. (And that's not even counting the wind power project currently under development south of Ferndale.) Unfortunately, we are at the end of power transmission lines having a capacity of only 70 megawatts (our peak usage here of about 160 MW), so a huge investment in new lines -- one estimate puts it at $200 million -- would be needed if we were to export sufficient power to make a dent in the state's power generation. More importantly in the long run, our prime location offers designers the opportunity to test various wave-power systems. All involve turbines of some sort, but there the similarity ends. Moving arms, oscillating pistons, floating tubes. Turbines on the surface, turbines on the ocean bed, turbines on land (with seawater arriving under pressure via seabed pipes). A few huge generators versus hundreds of smaller ones. The combinations are exhaustive. 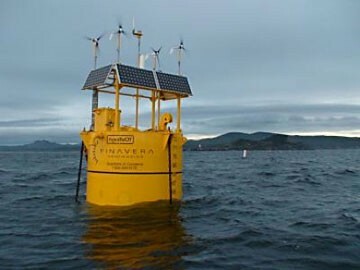 Which ones will actually make it to the point where wave power can be considered a serious source of renewable may be decided right here, off the coast of Humboldt County.